Scholar Metrics provide an easy way for authors to quickly gauge the visibility and influence of recent articles in scholarly publications. Today, we are releasing the 2018 version of Scholar Metrics. This release covers articles published in 2013–2017 and includes citations from all articles that were indexed in Google Scholar as of July 2018. Scholar Metrics include journal articles from websites that follow our inclusion guidelines and selected conference articles in Computer Science & Electrical Engineering. Publications with fewer than 100 articles in 2013-2017, or publications that received no citations over these years are not included. You can browse publications in specific categories such as Food Science & Technology, Sustainable Energy, or Public Health as well as broad areas like Engineering & Computer Science or Humanities, Literature & Arts . You will see the top 20 publications ordered by their five-year h-index and h-median metrics. You also can browse the top 100 publications in several languages - for example, Portuguese and Spanish. For each publication, you can view the top papers by clicking on the h5-index. Scholar Metrics include a large number of publications beyond those listed on the per-category and per-language pages. You can find these by typing words from the title in the search box, e.g., [heart], [water], [saude]. For more details, see the Scholar Metrics help page. This entry was posted in Google Scholar Blog and tagged Google Scholar on August 2, 2018 by Anurag. You can swipe left and right to quickly flip through the list of results. Where available, you can read abstracts. Or explore related and citing articles, which appear at the bottom of the preview along with other familiar Scholar features. 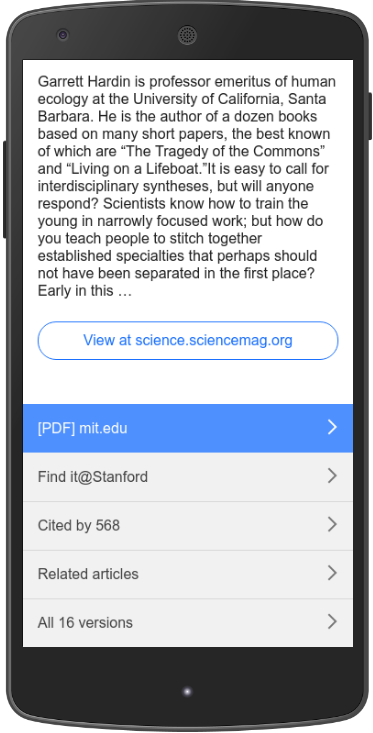 When you find an interesting article, you can click through to read it immediately, or you can tap the star icon to save it for later in your Scholar library. You'll need to sign in to the same Google account on both the phone and the laptop to use this feature. This lets you find and save papers on your phone wherever you are. Once you get home, you can grab a cup of coffee and click "My library" on your laptop to get to your reading list. Quick previews are available in Chrome, Safari, Samsung, and other standard browsers on recent Android and Apple phones. Sorry, they won't work in Opera Mini or other special-purpose browsers; and they are not, at this time, available on tablets. We would like to thank our partners in scholarly publishing that have worked with us on this. Working together, we hope to help make research more efficient everywhere. 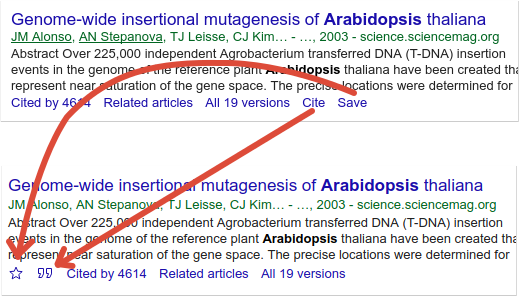 This entry was posted in Google Scholar Blog and tagged Google Scholar on March 21, 2018 by Alex Verstak. This entry was posted in Google Scholar Blog and tagged Google Scholar on October 14, 2017 by Anurag. If you thought Google Scholar had about twenty different screens, you'd be half right. We have just made it easier to find your way around them. Settings, advanced search, case law, and "my library" moved into the side drawer, which is now present on all screen sizes and all devices. If you're wondering how to get to a Scholar feature that you don't immediately see, it's probably in the drawer; click the menu icon in the upper left of the screen to open it. "Cite" and "save" options under each search result moved to the left and became icons. 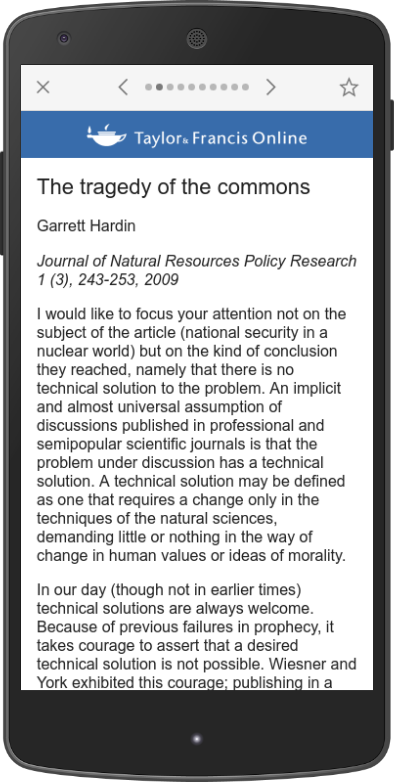 The quote icon shows formatted citations in a variety of styles - MLA, APA, Chicago, Harvard, Vancouver, - and links to export the citation to EndNote and other bibliography managers. The star icon saves the search result to your personal library, so you can read or cite it later. To review your saved articles, open the drawer and click "my library". Author profile pages got a cleaner look, especially on mobile devices. Rest assured, we did not change your citation counts - at least, not intentionally. It is, however, a good time to review your photo - it's now a circle - and to update your affiliation and research interests. Please visit your profile to review and update it. This entry was posted in Google Scholar Blog and tagged Google Scholar on September 23, 2017 by Alex Verstak. This entry was posted in Google Scholar Blog and tagged Google Scholar on August 5, 2017 by Anurag. Scholar Metrics provide an easy way for authors to quickly gauge the visibility and influence of recent articles in scholarly publications. Today, we are releasing the 2017 version of Scholar Metrics. This release covers articles published in 2012–2016 and includes citations from all articles that were indexed in Google Scholar as of June 2017. Scholar Metrics include journal articles from websites that follow our inclusion guidelines, selected conference articles in Computer Science & Electrical Engineering and preprints from arXiv and NBER. Publications with fewer than 100 articles in 2012-2016, or publications that received no citations over these years are not included. You can browse publications in specific categories such as Ceramic Engineering, High Energy & Nuclear Physics, or Film as well as broad areas like Engineering & Computer Science or Humanities, Literature & Arts . You will see the top 20 publications ordered by their five-year h-index and h-median metrics. You also can browse the top 100 publications in several languages - for example, Portuguese and Spanish. For each publication, you can view the top papers by clicking on the h5-index. Scholar Metrics include a large number of publications beyond those listed on the per-category and per-language pages. You can find these by typing words from the title in the search box, e.g., [allergy], [cardiología], [biomarkers]. This entry was posted in Google Scholar Blog and tagged Google Scholar on July 5, 2017 by Anurag. Scholarly research is often about the latest findings - the newest knowledge that our colleagues have gleaned from nature. Some articles buck this pattern and have impact long after their publication. Today, we are releasing Classic Papers, a collection of highly-cited papers in their area of research that have stood the test of time. For each area, we list the ten most-cited articles that were published ten years earlier. This release of classic papers consists of articles that were published in 2006 and is based on our index as it was in May 2017. To browse classic papers, select one of the broad areas and then select the specific research field of your interest. For example, Agronomy & Crop Science, Oil, Petroleum & Natural Gas, and African Studies & History. The list of classic papers includes articles that presented new research. It specifically excludes review articles, introductory articles, editorials, guidelines, commentaries, etc. It also excludes articles with fewer than 20 citations and, for now, is limited to articles written in English. This entry was posted in Google Scholar Blog and tagged Google Scholar on June 14, 2017 by Anurag. Google Scholar Library allows you to build your personal collection of articles within Scholar. 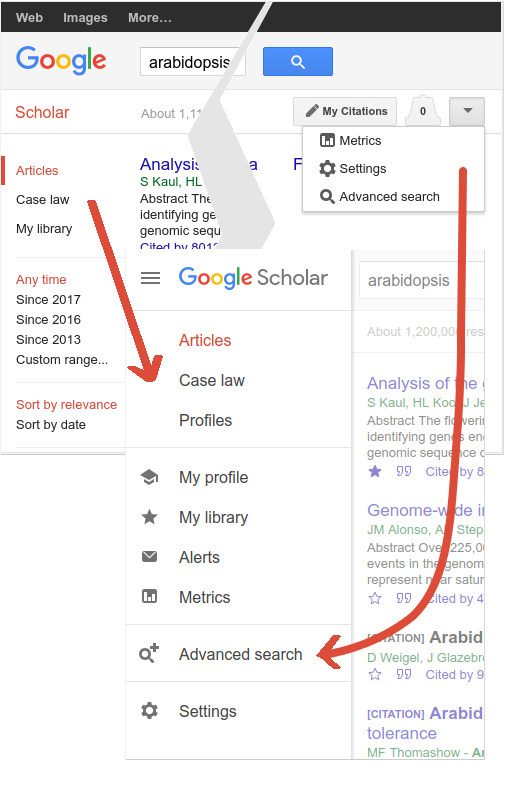 You can save articles right from the search page, organize them with labels, and use the power of Scholar's full-text search & ranking to quickly find just the one you want. 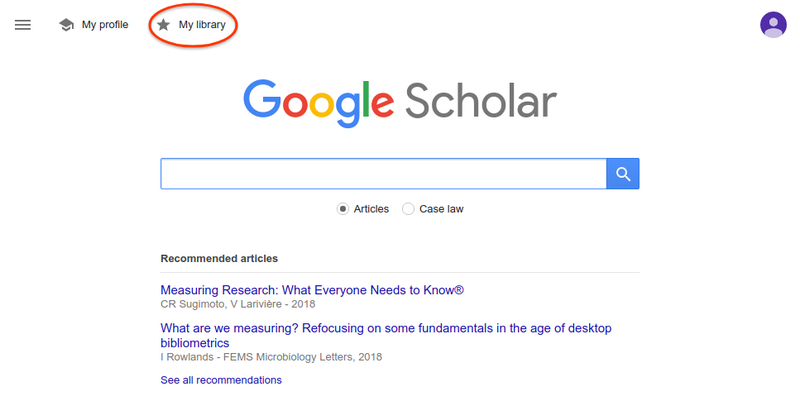 You decide what goes into your library and we provide all the goodies that come with Scholar search results - up to date article links, citing articles, related articles, formatted citations, links to your university’s subscriptions, and more. As personal libraries have grown over time, managing them takes more effort. Today we are making organizing your library easier by making it possible to update or export multiple articles with a single click. For example, if you are writing a new paper, you can quickly export the articles to cite to your favorite reference manager; if you are grouping papers that explore different aspects of your research area, you can select all papers in a sub-field and label them with one click. If you don’t yet have a library, it is easy to create one. This entry was posted in Google Scholar Blog and tagged Google Scholar on August 31, 2016 by Anurag. Scholar Metrics provide an easy way for authors to quickly gauge the visibility and influence of recent articles in scholarly publications. Today, we are releasing the 2016 version of Scholar Metrics. This release covers articles published in 2011–2015 and includes citations from all articles that were indexed in Google Scholar as of June 2016. Scholar Metrics include journal articles from websites that follow our inclusion guidelines, selected conference articles in Computer Science & Electrical Engineering and preprints from arXiv and NBER. Publications with fewer than 100 articles in 2011-2015, or publications that received no citations over these years are not included. Scholar Metrics include a large number of publications beyond those listed on the per-category and per-language pages. You can find these by typing words from the title in the search box, e.g., [journalism], [saúde], [genes]. In this release, we have added per-language pages for five new languages - Russian, Korean, Polish, Ukrainian, and Indonesian. This entry was posted in Google Scholar Blog and tagged Google Scholar on July 15, 2016 by Anurag.